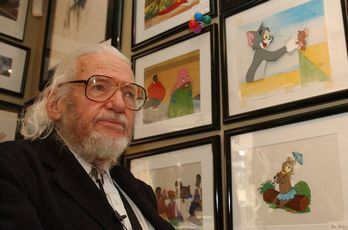 Word reaches us that veteran animator/director, Executive Board member and Golden Award winner TOM RAY died yesterday, April 7, at the age of ninety. Tom started at Warner Bros. in 1937 and worked for MGM after WWII in the Hanna-Barbera Tom & Jerry unit. After stints at Sutherland and UPA in the fifties, he went to Warners where he earned animator credits on a number of Bob McKimson and Chuck Jones cartoons. Over the following years he worked at one time or another for almost every major studio in L. A., including stints at Hanna-Barbera and Warners, and also founded his own shop, Archer Productions. He served more than once on Local 839's Executive Board, most recently in the period leading up to his retirement in 1988. After retirement he moved to the East Coast where he taught animation and founded Tomstone Animation. Tom's first wife, ink-and-painter Anna Lois Ray, who received the Golden Award in 1992, passed away in 1994. Tom is survived by his wife Brenda; his son Greg and daughters Donna Mouliot and Aloyce Levin (Greg and Donna have both worked in the industry), as well as five granddaughters, two great-grandsons and a great-grand-daughter. His funeral is scheduled for tomorrow at 6 pm at Grahame Funeral Home, 1112 Kempsville Road, Chesapeake, Virginia 23320. Click the link to the funeral home website, where you can get further information and also leave online condolences.